X-ray absorption is unaffected by changes in color density in the Gafchromic film. In contrast, visible light absorption follows the Beer-Lambert law, indicating that color change directly affects the quantity of visible light absorption. Meanwhile, whether a chemical color change affects the UV-A absorption of Gafchromic films is unclear. 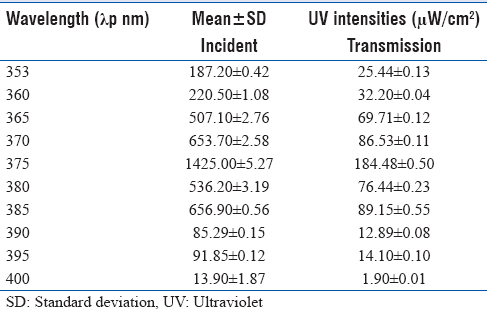 Although the changing absorbed intensity of UV-A rays cannot be directly measured on Gafchromic films, it can be indirectly determined from the intensities of incident minus transmitted UV-A. This study reports the measurement of changing UV-A transmission intensities through the active layer of Gafchromic EBT3 films as a substitute of UV-A absorption. The cannonball-type UV-A light-emitting diode (LED) series (Nitride Semiconductors Co., Ltd., Tokushima, Japan) was used in the experiments. Irradiation wavelengths ranged from 360 to 400 nm in 5 nm increments, with an additional point at 353 nm [Table 1]. 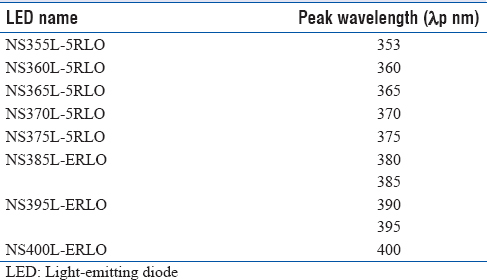 Wavelengths of the UV-A LEDs are listed in [Table 1]. Uniformity of the UV-A LED irradiation was within 80% of the peak intensity up to 7.5° from the isocenter. The Gafchromic EBT3 films (Lot# 04011401, expiry date: April 2016; Ashland Inc., Covington, KY, USA) were cut into trapezoidal shapes measuring 4.5 cm (top) and 5.5 cm (bottom). The Gafchromic EBT3 film without a UV protection layer was considered suitable for this study. Moreover, the active layer (lithium pentacos-10, 12-diynate) of Gafchromic EBT3 can be considered representative of other Gafchromic films. The intensities of incident and transmitted UV-A were measured by a UV meter (UVR-300 with a UD-360 probe [365 nm]; Topcon Technohouse Corporation, Tokyo, Japan) during 10 and 60 min of irradiation, respectively, and data were collected at 1 min intervals during each 10 min using BrightLoader 4 (Harvey Lab Corporation, Tokyo, Japan). The UV-A LED, Gafchromic EBT3 film, and UV meter were fixed on acrylic boxes (Comoglas CG UV40 P, 3-mm thickness, Lot# 140406C B; Kuraray Co., Ltd., Tokyo, Japan). 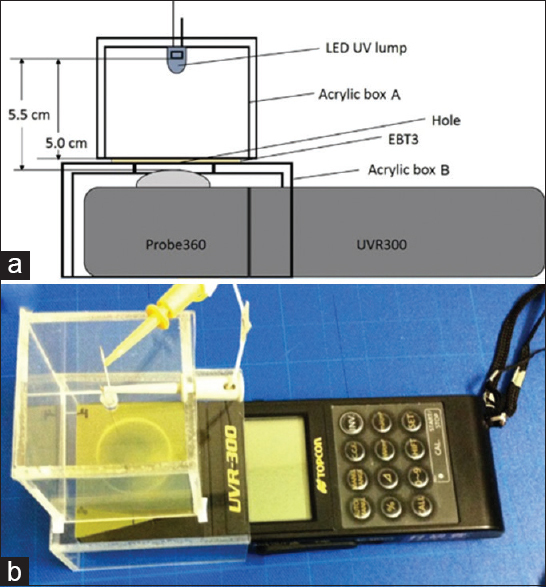 Positions of the UV-A LED, Gafchromic EBT3 film, and UV meter are shown in [Figure 1]a and [Figure 1]b.
Scanning of the Gafchromic EBT3 films was performed as described by Katsuda et al. for EBT2 and EBT3 films  with reflection mode. The moiré artifacts (Newton's rings) were reduced by designing a 5 μm gap of the matte polyester surface of the Gafchromic EBT3 film. To reduce the artifact even surely, a sheet of overhead projector film and liquid crystal display was placed in the irradiation path. All films were scanned with and without irradiation by UV-A. In addition, to improve the reproducibility of the scan position of Gafchromic EBT3, a scan position sheet was attached to the surface of the scanner glass. The Gafchromic film was always scanned in the same direction (portrait mode with 180° rotation). All experiments were performed at the room temperature of within 21°C-25°C. Pixel values in the subtraction image were analyzed by ImageJ 1.44o for Macintosh (National Institutes of Health, Bethesda, MD, USA). The subtraction image was constructed from the UV-A-irradiated image minus the non-UV-A-irradiated image. 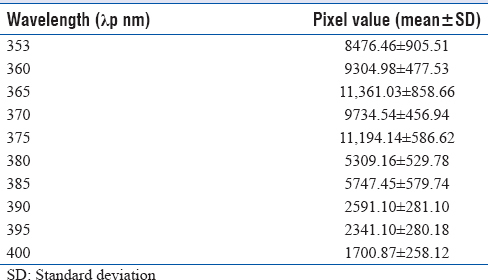 To measure pixel values, a region of interest (ROI; diameter 1.27 cm) was centered in the UV-A-irradiated region. The mean ± standard deviation (SD) pixel values in the ROI were identified by histogram analysis. The entire experiment was completed in 1 day. The maximum incident intensity of UV-A was observed at 375 nm. The maximum, minimum, and mean ± SD of the incident intensities were 1430, 1420, and 1425 ± 5.27 μW/cm 2, respectively [Table 2]. In contrast, the minimum incident intensity of UV was observed at 400 nm. In this case, the maximum, minimum, and mean ± SD incident intensities of the UV rays were 13.9, 13.9, and 13.9 ± 1.87 μW/cm 2, respectively. The maximum, minimum, and mean ± SD of the 375 nm UV-A transmission intensities were 185.2, 183.4, and 184.48 ± 0.50 μW/cm 2, respectively, and those of 400 nm UV-A transmission intensity dose were 2.0, 1.9, and 1.90 ± 0.01 μW/cm 2, respectively [Table 2]. The UV-A transmission intensities through the Gafchromic EBT3 film remained constant throughout the measurement period. The chemical color change of the film did not affect the UV-A transmission intensity. The 375-nm UV-A irradiation generated the maximum pixel values of Gafchromic EBT3. The mean ± SD pixel values of the Gafchromic EBT3 film irradiated at 375 nm were 11,194.15 ± 586.63 [Table 3]. Normal and subtraction images with an ROI including the Gafchromic EBT3 film are shown in [Figure 2]. Wavelengths between 385 and 395 nm were emitted by changing the forward voltage of the LED. These wavelengths were higher than the original wavelength between 380 and 390 nm of UV rays; however, data on incident and transmission intensities were consistent. The UV-A transmission intensities were measured at 1 min intervals during each 10 min by the UV meter. The color density was chemically altered in the final image. However, during irradiation by UV-A for 60 min, the transmission intensities of the Gafchromic EBT3 film remained unchanged at all tested wavelengths, indicating that the increase in color density does not affect UV-A transmission through the Gafchromic EBT3 film. After irradiation with 365 and 375 nm UV-A rays, the mean ± SD pixel values were 11,361.03 ± 858.66 and 11,194.14 ± 586.62, respectively, which are remarkably high values than others. The corresponding mean ± SDs of the UV-A transmission intensities were 69.71 ± 0.12 and 184.48 ± 0.50 μW/cm 2, respectively. Therefore, the transmission intensity of UV-A can be considered as being stable. According to the manufacturer's specification, more than 80% of the intensity is concentrated within 7.5° of the isocenter. Therefore, an area measuring 1.27 cm was chosen as the ROI for evaluation. As UV-rays are harmful for the human body, the UV-A irradiation experiment was performed in UV-irradiation boxes constructed from UV reduced acrylic plates. The relation between chemical color changes (pixel value) and UV-A transmission intensity in the Gafchromic EBT3 film was investigated. Transmission intensities were constant during 60 min of irradiation by UV-A LEDs. This indicates that the UV-A transmissions through the Gafchromic EBT3 film, regardless of chemical color change, were consistent. Therefore, UV-A can be used for irradiation as preexposure for Gafchromic films. This study was supported by JSPS KAKENHI Grant Number 26460740. Rampado O, Garelli E, Deagostini S, Ropolo R. Dose and energy dependence of response of Gafchromic XR-QA film for kilovoltage X-ray beams. Phys Med Biol 2006;51:2871-81. Liao YL, Kao HC, Chuang KS, Chen CP, Tsai HY. CT dose estimation using Gafchromic XR-CT film: Models comparison. Radiat Meas 2011;46:2052-5. Zhu Y, Kirov AS, Mishra V, Meigooni AS, Williamson JF. Quantitative evaluation of radiochromic film response for two-dimensional dosimetry. Med Phys 1997;24:223-31. Katsuda T, Gotanda R, Gotanda T, Akagawa T, Tanki N, Kuwano T, et al. Correction of nonuniformity error of Gafchromic EBT2 and EBT3. J Appl Clin Med Phys 2016;17:41-51. ISO. Space environment (natural and artificial) - Process for determining solar irradiance. ISO 21348:2007. Geneva: International Organization for Standardization; 2007. Lewis FD. A Guide to Radiochromic Film Dosimetry with EBT2 and EBT3. Advanced Materials Group, Ashland Specialty Ingredients, Spain, April 2014. Katsuda T, Gotanda R, Gotanda T, Akagawa T, Tanki N, Kuwano T, et al. Comparing three UV wavelengths for pre-exposing Gafchromic EBT2 and EBT3 films. J Appl Clin Med Phys 2015;16:449-57. Aydarous A, Al-Omary EA, Ghazaly ME. Characterization of Gafchromic EBT3 films for ultraviolet radiation. Radiat Eff Defects Solid 2014;169:249-55. Nitride Data Sheets. Nitride Semiconductors Co., Ltd.
de Gruijl FR. Skin cancer and solar UV radiation. Eur J Cancer 1999;35:2003-9.